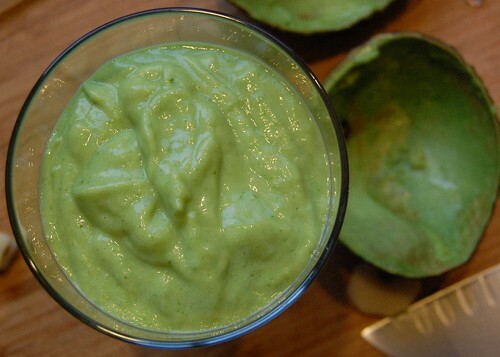 neverhomemaker: Hello, Avocado Green Smoothie! Tastespotting would reject this photo for bad lighting (and rightly so!). But if I'm up early and feel like posting, I'm not going to be too picky with the photos I take. Anyway, this morning it's all about the green smoothie. The temps are low . . . and I decided to postpone my run until after work. Gave me time to dig my knife and spoon into a ripe avocado and experiment with some flavorful combinations. Like I said, the avocado slicer is a useless gadget . . . so, I carved mine up using the basics. Why a green smoothie? I'm looking for some extra energy this morning. I'm feeling a cold coming on (you'll hear my stuffy nose in the video below). Green smoothies are freakin' amazing. It's something in the blending of the greens that helps all the nutrition pour out of the cell walls and right into your bloodstream. Better yet, you'll find they're a super easy way to add more greens and whole fruits to your diet. What's not to like? NOTE: Those of you who are familiar with green smoothies might know a little something about the 40:60 ratio. This smoothie doesn't abide by those rules, since avocado is a "fruit" -- but usually, you'd try to have 40% greens and 60% fruit. Anyone know if avocado is an exception to this "rule"? 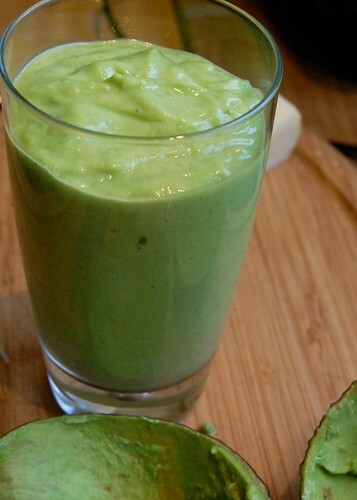 Again, this smoothie special because it's the first I've made with avocado. And after drinking it, I'm a convert. Everything is so rich and smooth. So, we've got the texture covered . . . but how does this green monster taste? Green Smoothie & Happy Friday! from (never home)maker on Vimeo. What you'll need (for a HUGE smoothie -- but, hey -- you're supposed to drink 1 quart) . 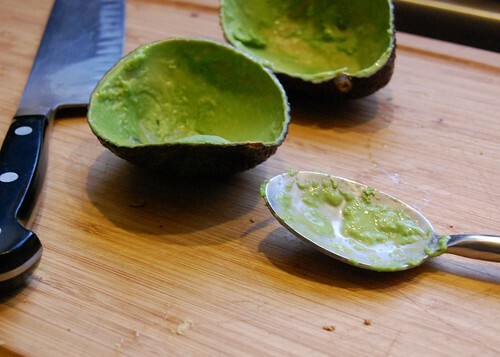 . .
1 avocado, taken out of its shell, etc. Add a bit of agave nectar if it isn't sweet enough for you.